Healthy summer salads are a staple at our house, especially during summer. I love the fresh produce summer brings us. Now that I am really trying to focus on the 21 Day Fix nutrition, that means eating more veggies and fruit than I had been. An even better reason to make sure to eat healthy summer salads. Although some salads can be misleading for weight loss, these healthy summer salads will keep you on target for your new healthy living goals. We are still in Vegas today for baseball tournaments and as outlined in yesterday’s post, eating healthy while on vacation isn’t always easy. If you are vacationing soon, make sure to check out the 8 Foolproof Tips to Prevent Weight Gain While on Vacation. 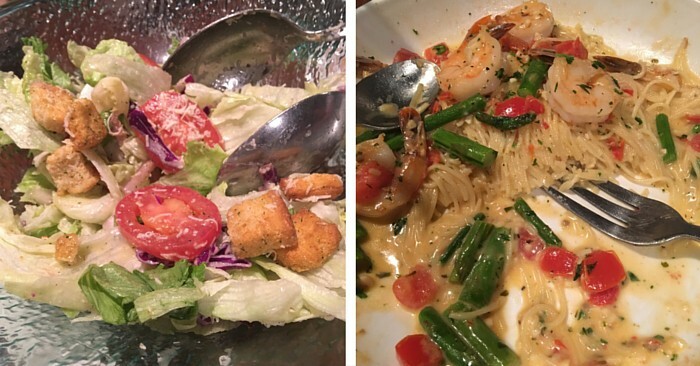 For dinner tonight, we went to Olive Garden for what else…bottomless salad. There aren’t too many restaurants you can depend on in new places to have fresh, crisp salad than the Olive Garden. Andrew and I decided to share dinner, as we often do. We had the bottomless soup and salad, plus a Shrimp Scampi Pasta dish (one of the Light choices at 540 calories for the entire portion). It was all delicious! We even brought leftovers back to the hotel. So, in thinking about how much I love cold fresh foods in summer, I definitely wanted to share some fabulous summer salads with you guys! Be sure to try all 3 and come back to let me know which one was your favorite! In a small bowl, toss together strawberries, avocado, pepper, cilantro, lime juice and salt. Heat a pan over medium high heat and add the oil. Season the chicken with salt and pepper to taste. Cook for 3-4 min on each side or until fully cooked. 1. Combine all of the ingredients for the dressing in a food processor. Pulse until smooth. Chill as desired. 2. Combine all of the ingredients for the salad together. 3. When ready to serve, toss dressing and salad together. Cook pasta according to directions. Drain and cool. In a non-stick pan, over high heat, place corn and zucchini with salt and pepper to taste. Allow corn and zucchini to roast, only stirring lightly. Cook for 3-4 minutes, or until browned and roasted. Do not overcook. Allow to cool. Chop Avocado, toss with lemon juice. Combine corn, zucchini, tomato, avocado and pasta. Pour about half of the Italian dressing over and toss. When ready to serve, pour additional dressing on as needed. Top with Feta cheese and basil, if preferred.